Just popping in to share a quick card I made using a new stamp from ODBD. 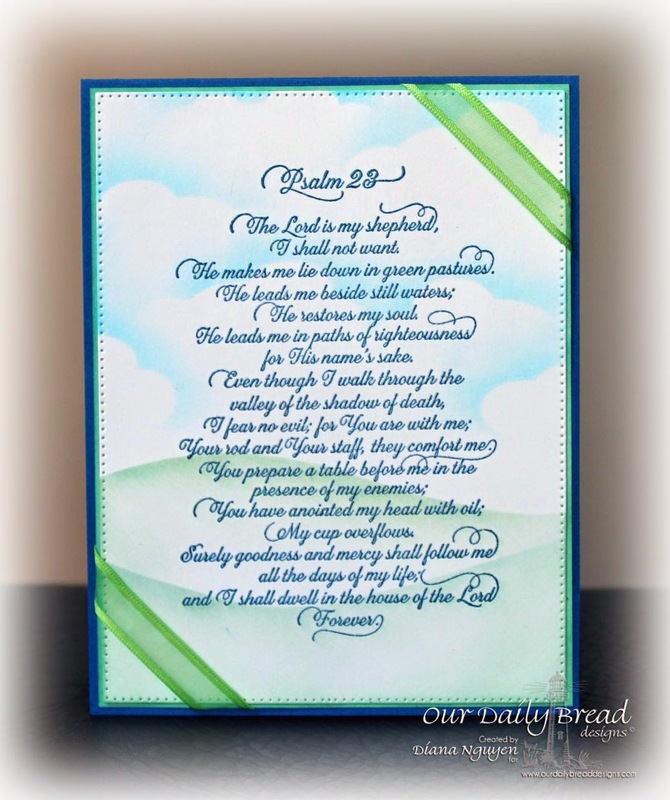 This was made using the Psalm 23 stamped with Momento Luxe Nautical Blue and clear embossed. I then centered and die cut it out using ODBD Flourished Star Pattern. I then sponged some clouds and hills by masking. I added some ribbons and matted it with green card stock onto a blue card base. A very simple card but the embossed words really make it elegant. I really love this one, and not just for the beauty, but for the meaning -- you posted it on the 10th anniversary of my mothers death, and one of these verses is what I put on her tombstone. It really spoke to me. What a wonderful CAS card to hightlight the inspiration of the Scripture...Great job as always! So delighted you joined us at Word Art Wednesday. A new challenge started today so, I hope you link with us again. Leaving you with God's inspiration in Ephesians 3:16-18 which says, "I pray that out of his glorious riches he may strengthen you with power through his Spirit in your inner being, so that Christ may dwell in your hearts through faith. And I pray that you, being rooted and established in love, may have power, together with all the Lord’s holy people, to grasp how wide and long and high and deep is the love of Christ." Hugs always!